China has warned citizens travelling to Singapore to be careful of shopping scams, following a tourism controversy in the South East Asian city. Singapore has been gripped by the plight of a holidaying Vietnamese factory worker scammed of two months' wages when trying to buy an iPhone 6. The case and subsequent attempts by Singaporeans to help him have made headlines regionally. Singapore has long prided itself on being a safe tourist-friendly spot. An advisory posted on China's Consular Services website noted that there had been "many cases last year" where Chinese tourists were cheated when buying electronic goods. It said that Chinese tourists who wish to buy mobile phones or other expensive electronic devices in Singapore should first check if the shops they are patronising have had complaints lodged against them. The Consumer Association of Singapore maintains a list of errant retailers. China is the fastest growing source of tourists to Singapore, which is also popular with other Asian visitors. Earlier this week, Singaporean media reported a case where Vietnamese tourist Pham Van Thoai was tricked into signing a phone warranty contract at a mobile shop in a well-known electronics shopping centre,. The same shop had previously made the news for refunding a Chinese tourist hundreds of dollars in coins. Concern had already been mounting in Singapore of persistent tourist scams. But Mr Pham's case provoked nationwide sympathy and outrage at the shop when newspapers published a photo of him sobbing and a video of him begging on his knees for a refund, filmed by shop staff, surfaced online. Though he called in the police and consumer association officials, he still lost S$550 (£266; $440) - the equivalent of more than two months' worth of wages - and left without a phone. The incident sparked concern about consumers' rights and apparent damage to Singapore's image as a tourist destination. Frustrated at the lack of punishment, some netizens have named and shamed the shop's owner and published online his personal details, including his address, phone numbers and photos of him posing shirtless. Others donated to a crowdfunding campaign started by a Singaporean to reimburse Mr Pham, which has gathered nearly US$12,000. "This is not okay. This is not right. We are not a nation of thieves and cheats," the campaign website said. 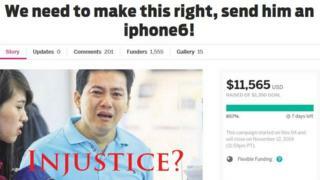 Mr Pham however has reportedly said a Singaporean businessman gave him money for a phone, and declined to accept more donations. The response has been widely covered by Vietnamese media, as well as other South East Asian news outlets, and has drawn appreciative comments from the Vietnamese. "Thank you Singaporean people... I really admire your kindness and devotion to foreigners like us," said one on Facebook.